Isabel Flens controls the ball. 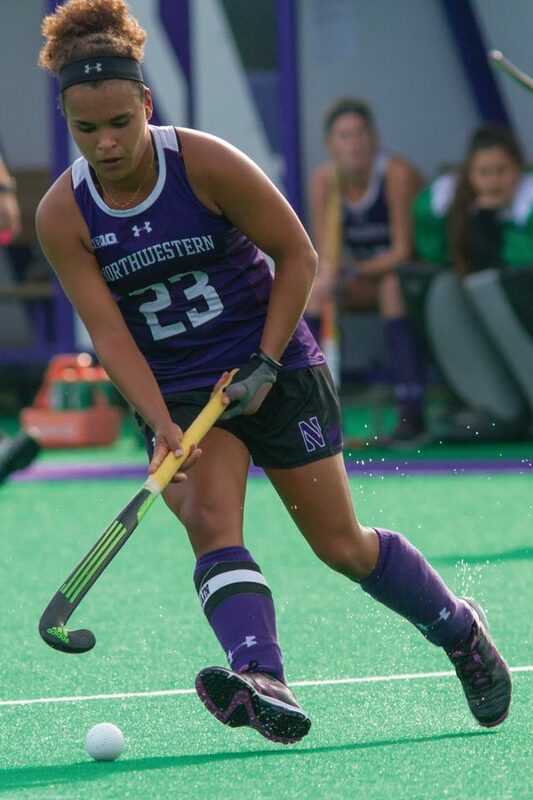 The senior forward received a yellow card at the end of regulation in Northwestern's game against Maryland, giving the Terrapins a one-player advantage that they capitalized on early in overtime. COLLEGE PARK, Maryland — It had been 363 days since Maryland crushed Northwestern’s 2015 NCAA Tournament dreams, beating the Wildcats in double overtime of last year’s Big Ten Tournament semifinals. On Friday, NU couldn’t prevent history from repeating itself. After giving Maryland (17-3, 7-1 Big Ten) its only conference loss during the regular season, fourth-seeded NU (13-8, 5-3) couldn’t get the better of the top-seeded Terrapins this time around, conceding in overtime to fall 3-2. The loss was ultimately the team’s final game of the season, as it did not receive an at-large bid into the NCAA Tournament field as announced on Sunday. The deciding moment for the Cats came at the end of the second half. In the 69th minute of the game, NU senior forward Isabel Flens received a yellow card, sidelining her for five minutes and forcing the Cats to play a player down. Maryland opened overtime with a one-player advantage and capitalized. Coach Tracey Fuchs said the team game-planned for playing in overtime, but, in the end, the Terrapins just got the better of them. NU started the game strong. After taking down fifth-seeded Iowa 3-1 in the first round of the tournament, the Cats picked up their scoring where they left off. Six minutes into the game, Flens followed up a penalty corner with a powerful shot of her own, and redshirt-freshman back Kirsten Mansfield deflected the shot to put the team up 1-0 early. But just four minutes later, Maryland responded. The Terrapins scored their only goal of the first half on a strike from graduate defender Grace Balsdon off of a penalty corner. The first half was a back-and-forth of penalty corners for the feuding teams, as Maryland racked up five and the Cats three. Flens then sparked the offense again in the 20th minute, scoring on a strike in the lower-left corner of the goal. Despite going into halftime with a 2-1 lead, Fuchs said the team didn’t change anything with its game plan. In the 54th minute, Terrapins freshman forward Sophie Pelzer stepped up for Maryland, capitalizing on a Cats green card and tying the game up at 2-2. When Flens received the yellow card at the end of the second half, Fuchs said the team just tried to keep the ball out of its defensive zone and milk the penalty. But Big Ten Player of the Year Welma Luus finally got the better of NU junior goalkeeper Lindsay von der Luft to end the game. Flens said she was disappointed in herself for getting the penalty, despite serving as a major contributor for the Cats offense. The defeat to the Terrapins was followed up with more heartbreak on Sunday, when NU was not given a bid to the NCAAs to end its season. While the team had assumed a win over Iowa on Thursday was enough to secure a spot in the tournament,the Cats are instead on the outside looking in for the second-straight year. Fuchs said not being chosen is tough to swallow for a team that had several strong wins this season.